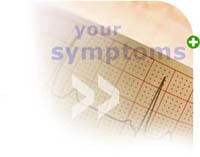 Symptoms Analyser was written by, a General Practitioner in Watford and a prolific writer. He has written numerous books including the Hamyln Family Health Encyclopedia and the Royal Society of Medicines First Aid Guide. He also writes articles for publications such as the British Medical Journal, Daily Telegraph, and the Express. Simply select the appropriate link from the list below to discover what could be the problem with you. Please read our Disclaimer and Conditions Of Use.